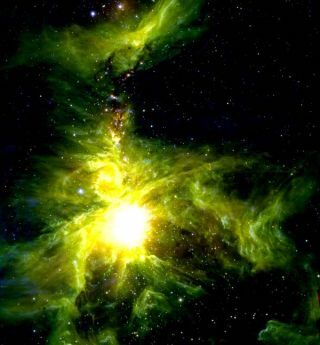 Parts of the Orion Molecular cloud are illuminated by nearby stars and therefore glow an eerie green color. The jets punch through the cloud and can be seen as a multitude of tiny pink-purple arcs, knots and filaments. The young stars that drive the jets are usually found along each jet and are colored golden orange. Amateur stargazers may spot the Orion Nebula as a fuzzypatch in the constellation Orion, but they cannot see an interstellar birthingground that spans the region of sky from above Orion's head to below his feet. Now astronomers have completed the most wide-ranging censusof baby stars in and around the Orion nebula, and found a stellar nurserythat's both chaoticand crowded. The work represents the first complete study of young stars,their gaseous clouds of dust and supersonic jets of hydrogen molecules shootingout from the poles of each star. Jets arise as young stars are born from a rotating cloudof gas and dust, but usually die out once a star has fully ignited and stoppedconsuming the surrounding material. In this case, the jets becamesignals that pinpointed the location of baby stars hidden within thestellar birthing grounds. "With such a large number of young stars, we canstudy the 'demographics' of star birth," said Tom Megeath, an astronomer atthe University of Toledo in Ohio. "This study will give us an idea of howlong it takes baby stars to bulk up by pulling in gas from the surrounding cloud,what ultimately stops a star from growing bigger, and how a star's birth isinfluenced by other stars in the stellar nursery." The Orionnebula represents just a blister on the surface of the much larger cloud.Astronomers turned to the United Kingdom Infra-Red Telescope (UKIRT) and theSpitzer Space Telescope to peer through the cloud using infrared vision, andalso used the Institut de Radio Astronomie Millimetrique radio telescope inFrance to see beyond infrared at short radio wavelengths. Such international collaboration allowed astronomers tomatch up powerful gas jets with their youngstar origins, and find the cradles within the clouds where stars werecreated. "Each jet is travelling at tens or even hundreds ofmiles per second; the jets extend across many trillions of miles ofinterstellar space," said Chris Davis, an astronomer for UKIRT in Hawaii. UKIRT's wide field camera alone found more than 110individual jets from the one region of the Milky Way. The results werepresented on April 20 at the European Week of Astronomy andSpace Science at the University of Hertfordshire, UK.